Tiger girl posing with mascots of Lihpaoland. During our last trip to Taiwan the kids wanted to go to a Theme Park that had both fun and thrilling rides and water rides too. 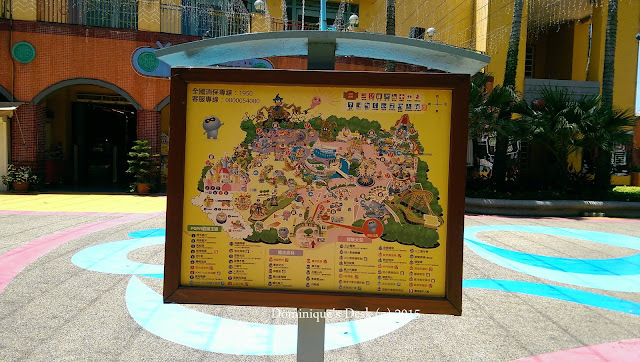 In the end we decided on Lipaoland in Taichung as it had both a Theme park and a Water park side by side. To reduce the time we would spend travelling we booked a package deal which gave us a two day access to both parks and one night stay at the Fullon hotel with both buffet dinner and breakfast. The hotel was located on the grounds of the theme park and it only took a 5 min walk to either park. The family room we booked was certainly huge as it had two queen size bed and a tatami bed for all 5 of us. The kids had fun alternating between the queen size bed and the tatami as all wanted to take turns sleeping on the floor. We headed to the park shortly after it opened for business. As it wasn’t the holiday season for schools in Taiwan there wasn’t a crowd at all. In fact it was almost relatively empty and it felt like we had the whole place to ourselves. The most awesome part of it was there were NO QUEUES!! The kids could have as many rounds as they wish on the different rides. We had our fun on the bumper cars. The boys and R went on the roller coaster rides while Tiger girl and I went on the gentler ones. 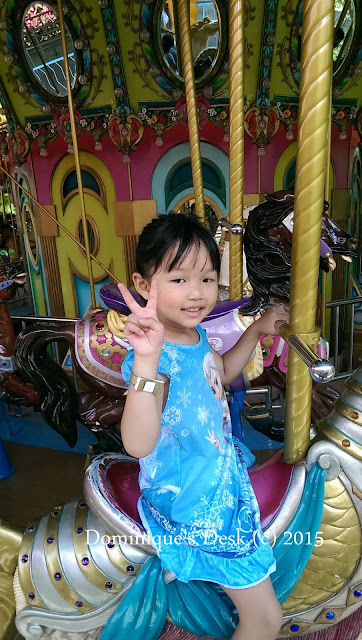 The Merry-Go-Round is one of Tiger girl’s favourite ride. She went on it a couple of times when we were at Tokyo Disneysea 2 years ago. This has to be one of the most exhausting rides for Tiger girl and Doggie boy. They had to manually pedal as hard as they could to get the snail to go around the whole track. Talk about a Snail Ride!! There were quite a couple of display areas where one could snap photos but I gave many a miss due to the intense afternoon heat. It was scorching hot from the summer sun and the kids and I couldn’t wait to retreat back to the hotel for a rest. Where have you been this holidays? Thanks for hosting this wek. You outing looks like so much fun!! What lovely cute photos what a fun place heheh! lovely photos and seems you all had happy moments…. Awww loving your trips! You have been to so many beautiful places. This one is a cute place! Looks like they had loads of fun. It’s such a colorful park, perfect for fun photos. What a fun and activity-filled day! Good thing the tickets are for unlimited rides. This is too much fun! It’s a great idea to stay in a hotel if you are visiting a park as big as that. This theme park looks like so much fun! My son would love the bumper cars. This looked like a whole lot of fun. I can not wait till I am able to take my son to one of these parks. That does look like fun! I want to take our boys to a theme park. They love it! Nice to know that there are theme parks in Taiwan. I have very little knowledge in Taiwan’s tourist spots. The first picture is my favorite! That looks like a fun place to visit! I wish we could visit it one of these days. i love going to theme parks and with my age I still enjoy riding kiddie rides but afraid to ride a roller coaster. i had spent my last holidays in Manila with the fam bam. I had a wonderful time with them. The park really looks interesting and bet the kids and young at hearts really enjoyed their time.